As summer seems to only last for the odd week or so every year the last thing you want to do on a hot day is get flustered in the kitchen, fight with pots and pans and work up a sweat. Food should be quick, easy and tasty and a simple salad is the perfect accompaniment to a glorious day in the garden or park, taking in a few rays. A salad is probably one of the most versatile meals you can prepare as it can span so many different plates of food. From a simple combination of lettuce and cucumber, to a seafood or pasta salad that’s filling enough to be enjoyed on its own as a main meal, salads suit any occasion. With just a few ingredients you can create a healthy meal that’s light but filling and, with many summer salads, all the work can be done in advance and your salad can be kept in the fridge until you’re ready to eat. We’ve come up with some traditional, as well as slightly more unusual, ideas below that are all really quick and easy to prepare. 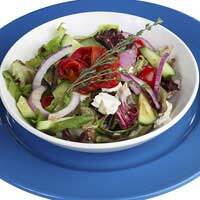 This is a variation of the classic Greek salad. Chop a couple of little gem lettuces and place in a bowl. Slice a pack of cherry tomatoes in half and mix in with the leaves. Cut half a pack of feta cheese into cubes and scatter over the top then scatter over some pitted black olives. Drizzle with olive oil. Bring a large pan of water to the boil and add a small pack of baby new potatoes. Cook until tender then rinse under cold water and set aside. Chop about four rashers of bacon and fry or grill until crispy. Put the potatoes in a large bowl, add 1 tablespoon of mayonnaise and 1 tablespoon olive oil and mix carefully so the potatoes don’t break up. Scatter the bacon over the top. Another variation of a classic salad. This is a good one for using up any leftover chicken from a Sunday roast. Chop a cos lettuce into even pieces and place in a large bowl. Cut cooked chicken into small slices and mix into the leaves (a couple of handfuls of chicken should be adequate). Scatter over a handful of croutons and a good pile of freshly shaved Parmesan. Mix well and drizzle over some Caesar dressing. This simple bean salad uses canned ingredients – perfect for a store-cupboard clearout! Drain and rinse a can of chickpeas, a can of kidney beans and a can of sweetcorn (use all small or large cans). Place them all in a large bowl and mix together. Chop a handful of fresh mint and a handful of fresh parsley and add these to the bowl. Add a tablespoon of olive oil and a dash of white wine vinegar (optional). Mix to combine. Trim and halve half a pack of French green beans and boil until tender. Add two eggs to the pan about 7 minutes before the beans are ready. Meanwhile, drain a can of tuna and chop 1 little gem lettuce. Put these ingredients in a large bowl. Drain the beans and leave the eggs under cold running water, to cool them down. Add the beans to the bowl and mix to combine. Remove the shells from the eggs, cut them into quarters and place them on top of the salad. Drizzle over your favourite dressing. These are just some starting points and the great thing about salads is that you can add and subtract ingredients depending on what you like, what you have in the cupboards, or just what you fancy at the time.